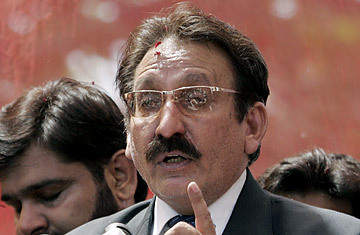 Chief Justice Iftikhar Muhammad Chaudhry will administer the oath for the newly elected members of the Karachi Bar Association (KBA) at the Sindh High Court lawn on Saturday, announced KBA president Advocate Muhammad Aqil at a press conference on Thursday. Aqil said that all lower and high court judges have been invited to the ceremony along with representatives of all 33 Sindh bars and seven members of the Pakistan Bar Association. KBA general secretary Syed Haider Imam Rizvi said that a committee of the chief of police, DG Rangers, DIG Special branch and the high court registrar will be in charge of security. The ceremony will be kept short as a result of security concerns and other reasons, he added. “We want to strengthen the unity among us, provide stability to freedom of judiciary, maintain the freedom and give it more strength,” said Aqil. He also thanked the SHC Chief Justice Mushir Alam for allowing the ceremony to be held at the high court and encouraging them. Speaking of violence against lawyers, Aqil said that the KBA condemns the kidnapping of judges and lawyers in Balochistan and demands the government immediately rescue them. He also spoke of an Islamabad-based lawyer who was beaten up by members of the media. Published in The Express Tribune, March 4th, 2011.